We are playing with fire. Quite literally. As climate change warms our planet, the frequency and intensity of extreme weather events continues to rise, with both floods and droughts wreaking havoc. Among the key threats in many locations has been the outbreak of uncontrollable, damaging and dangerous wildfires. In 2015 wildfires burned a total of 10.1m acres in the United States, which roughly equals 9.2 million football fields, double the area typically lost to wildfires 30 years ago. Scientists have predicted that the area hit by wildfires will double by 2050. The main reasons behind this phenomenon are the higher temperatures in the summer and decrease in rainfall all throughout the year, both caused by global warming. This sounds rather logical. What you may not know is that higher temperatures lead to an increase in pathogens and pests in forests, which in turn is responsible for killing trees that then serve as highly combustible dry fuel once the wildfires break out. A recent report by the United States Department of Agriculture has found that the resilience to droughts most forests in the world used to have seems to be reaching some sort of limit. Forests increasingly appear to be incapable to accommodate harsher changes in the climate and among the consequences is a sharp increase in wildfire that create is a vicious circle as warmer and windier conditions create fires that burn more intensely and spread more efficiently. 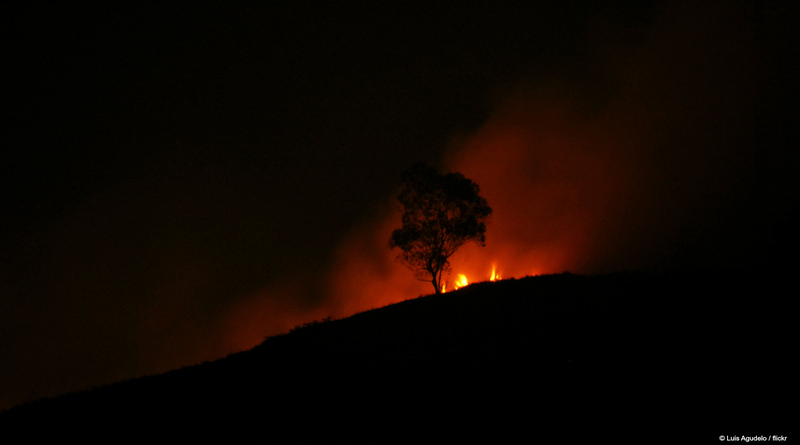 How then does the increase in wildfires affect the economic, environmental and human aspects of life? Economic. Surely anyone can imagine the consequences of a wildfire let loose: mass destruction and considerable loss. The cost of property loss due to wildfires in 2014 is estimated to be $11.6 billion. Even in instances where the wildfires are stopped on time, the economic consequences are very significant. In 2015 for example, the U.S. Forest Service spent around 65% of its $5bn budget fighting wildfires. Environmental. Wildfires destroy habitats and kill both vegetation and animals. The pollutants in the smoke from wildfires travel far, killing crops and damaging the fertility of the soil. Wildfires also release massive amounts of carbon dioxide into the atmosphere, which in turn fuels climate change. Yes, wildfires are a natural part of the lifecycles of ecosystems, it is a way of breaking down nutrients and it acts as a natural disinfectant, but at the moment only 3% of wildfires break out due to natural reasons and too many wildfires are harmful. Human Life. Wildfires cause massive air pollution, especially in the creation of particulate matter, which can travel long distances and are very harmful to people, most notably those with compromised respiratory systems. The immediate smoke from wildfires, containing high levels of carbon monoxide, is extremely dangerous. Researchers have estimated that worldwide wildfire smoke kills around 339,000 people a year. Possible solutions. Taking into account that scientists have predicted that the area covered by wildfires will double by 2050, what can we do? When it comes to the warmer summers and decreasing amounts of rain, which causes the increase in wildfires, the only possible solution is a continued fight against climate change to drastically reduce emissions of green house gases. Concrete steps to decrease the size and number of wildfires, according to the United States Department of Agriculture, would be to thin the forest and manage the amount of dead matter and dead trees. But we can address climate change – it is not too late. To do this, it is imperative that Governments, particularly those in the developed world, move rapidly to adopt, whole-scale the production of energy from renewable sources and away from our saturated, harmful carbon economy. We need massive investment in research and development, energy infrastructure and capital projects. We need to see the sharing of technology and assistance for the developing world to help them to develop clean technologies that provide them with the benefits the wealthy world has welcomed for so long. What we need now is shared knowledge, political will and coordination and a global level.